St. Thomas, U.S. Virgin Islands. 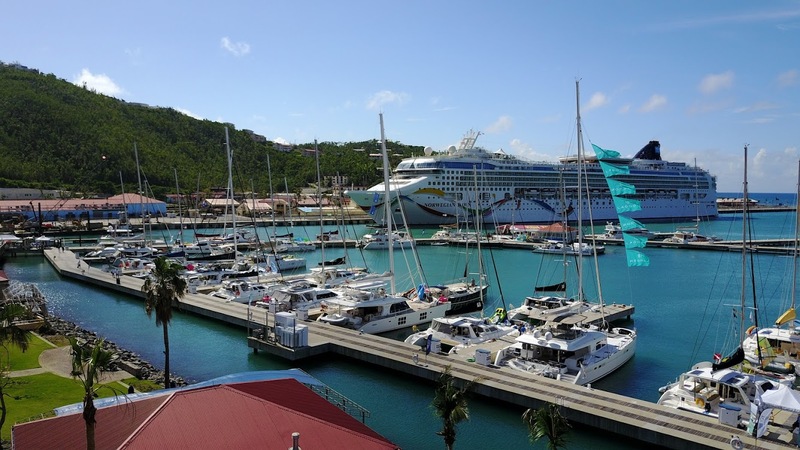 The success of the USVI Charter Yacht Show proved St. Thomas is back on the map and open for business in terms of marine tourism in the wake of two major hurricanes in September. Sixty-six charter yacht brokers from the Caribbean, U.S. and Europe visited the three-dozen luxurious 40- to 93-foot sailing and power yachts that nearly filled the available docks at IGY’s Yacht Haven Grande Marina. The November 11 to 14, 2017 show was hosted by the VI Professional Charter Association (VIPCA). The multi-faceted four-day show offered many events designed to give brokers ample opportunities to meet the crews and tour the yachts the brokers will book on charters in the coming weeks and months. These included a kick-off crew party, marine charter conference, Speak Easy themed yacht hop, culinary and cocktail competitions, and a sunset cruise awards dinner aboard the iconic day charter vessel, Kontiki. Winners of the various contests highlighted the caliber of the Virgin Island’s crewed yacht product. For example, the 62-foot Privilege catamaran Anastasia won Best Crew and Best Boat over 50 feet, while the honor for Best Crew in the under 50-foot category went to the 45-foot Leopard, Free Ingwe, and Best Boat to the 47-foot Nautitech catamaran, Nemo. Anastasia’s chef, Rebecca Silva, earned first place in the Entrée and Dessert competition, while Missy Kay on the 47-foot Leopard catamaran, Pisces, took top honors in appetizers. Chefs were tasked to create dishes incorporating coffee by VI Coffee Roasters. Two events in particular, the MBW volunteer day and the marine charter conference gave show participants an opportunity to get a real-time update on island services and state of the cruising grounds (with imagery from the Marine Rebuild Fund’s charter itinerary survey) as well as a chance to give-back. Attendees also learned about the Marine Rebuild Fund or MRF (www.ViMarineRebuild.org) which was set up by VIPCA, the St Thomas Yacht Club, VI Hotel and Tourism Association, Coastal Zone Management and Pizza Pi and is managed by the Community Foundation Virgin Islands (CFVI). Its mission is to provide monies for re-establishing a stable marine industry and a safe, appealing cruising ground, and to boost marine tourism in the USVI in the aftermath of the 2017 hurricanes. “The good news is that now having surveyed both the USVI and the BVIs we are confident in reassuring the world that our cruising grounds retain their natural beauty. Our surveys show that most of the beaches and the waters are in excellent condition and ready for visitors, boaters, snorkelers and beach lovers. The MRF has identified where there is work to be done and where its monies will assist a speedier recovery.” says Blake. Beyond charter yachts, other signs that the U.S. Virgin Islands marine tourism industry has successfully pushed the re-set and re-open button is the visual from the show itself. From a second-floor balcony at IGY’s Yacht Haven Grande marina, two superyachts on the docks, a cruise ship on port call and day boats providing excursions to these cruise visitors were all visible in the background of the yachts showing. Blake and her VIPCA Board of Directors are already looking ahead to next year. “Three goals for the future are to continue to train VI youth for employment in the marine industry, create greater freedom in movement between the U.S. and Spanish Virgin Islands, and to develop a superyacht factor to the VIPCA Charter Yacht Show 2018 while maintaining a strong community element with our continued support of MBW.” says Blake. Sponsors of VIPCA’s 2017 USVI Charter Yacht Show are Yacht Haven Grande, Gowrie Group, USVI Department of Tourism, Denison Yacht Sales VI, Stoli (West Indies Co.), Captain Morgan (Bellows International), Bohlke Air, International Medical Group (IMG), Charter Yacht Brokers Association (CYBA), 1First Bank, Cardow Jewelers, Orogold Cosmetics, The Fruit Bowl and Fresh Bistro. Proceeds from the VIPCA Charter Yacht Show were donated to My Brothers Workshop and the CFVI Marine Rebuild Fund. Previous Previous post: The Triton Article : The Show Will Go ON!